We really enjoyed the art all around the hotel and the location was great. Walking distance of everything we wanted to do downtown. Great location but we got a room that was very loud. The staff switched us but our new room did not have hot water. Great location! Staff was wonderful! Art tour was such an unexpected treat! Love the wine reception, live music, milk and cookies and breakfast! Had a 25th anniversary get away. Vendue Inn was perfect. We arrived to a complimentary happy hour with an artist painting/creating in the lobby! Staff and facilities are warm welcoming and beautiful! It was fun to just roam the halls and see all the different art. Room was very comfortable and gorgeous Loved it all! Very nice hotel. Staff helpful. Room was comfortable and inviting. Defiantly want to stay there again. Only issue was the elevator going to the roof top bar. Really, only 8 people at a time? The line became very long just waiting to get on. I don’t normally write negative reviews, but maybe this could save someone from a dissapointing vacation. First of all, we walked in the room and noticed the AC in room didn’t cool the room. The maintenance Guy recommended to turn the fan on high. There was condensation dripping from the ceiling vent. The maintenance guy went to fix the AC unit on the roof and came back and made our room smell like cigarette smoke. The WiFi was spotty in our room and could only be accessed in certain places of our room and the speed was very slow. I wasn’t able to do work efficiently in our room. The maintenance guy recommended us to go two buildings down to the concierge desk computer if we needed internet. This is 2018. We can’t hardly breathe without internet these days. The TV had no signal for approximately 15 min when turning it on. Our room was right next to the stairwell and the walls are poorly insulated. People were loud, yelling and stomping up and down the stairs all night and waking my pregnant wife multiple times throughout the night. There was chipped paint on the walls and mold on the grout in the shower, the toilet was loose and wiggly. The bathroom was the nicest part of our room. Overall our experience was very different than what we were expecting based on the pictures online. Where to begin, well with one word I would say superb. I have stayed at the Ritz Carlton, Four Seasons, Sandals and even The Broadmoor. The quaintness, service and attention to detail exceed them all. Once a year my mom and I go on a mother/daughter trip, it’s a very special 4 day/3 nights we look forward to. This year there was a conference we wanted to attend in Charleston and we had never been. I’m a sales manager and bad customer service is my biggest pet peeve. We didn’t have one ounce of a bad or even mediocre experience. From the moment we walked in after our 7 hour drive until we pulled away, every employee treated us as if we were the only guest. I’ll pause here and say that we stayed in an interior King room in Vendue 26. Kam greeted us, directed us how to check-in, took care of our car and bags. Each time we needed our vehicle it was easy and prompt. Mark was amazing as well, he made sure we had everything we needed, took pictures of us, gave us directions and at checkout even retrieved our vehicle before I even asked! The rooftop bar was a lot of fun. We had the margarita pizza and the Greek platter. The continental breakfast was the best I’ve ever seen, the appetizers and wine from 4-5, the music in the lobby in the evening and milk and cookies from 9-10 were all welcome treats. The hotel focuses on attention to detail and customer service. Everyone we encountered seemed genuine, to love their jobs and to take responsibility for the hotel. We booked this Hotel after reading T&L magazine give it high praise. We found the hotel crowded and noisy. People were up and down the corridors and the rooms have poor sound proofing. The floor of the room was all scratched up and needed a good vacuum. The toilet looked less than clean. The complimentary breakfast was sparse and kept running out the few breakfast items they served. Over all very disappointed. Location cannot be best. Around the corner is High Cotton and Slightly North of Broad. Both fantastic restaurants. The Vendue is trendy/artsy, but very nice. Enjoyed my stay will Stay again. 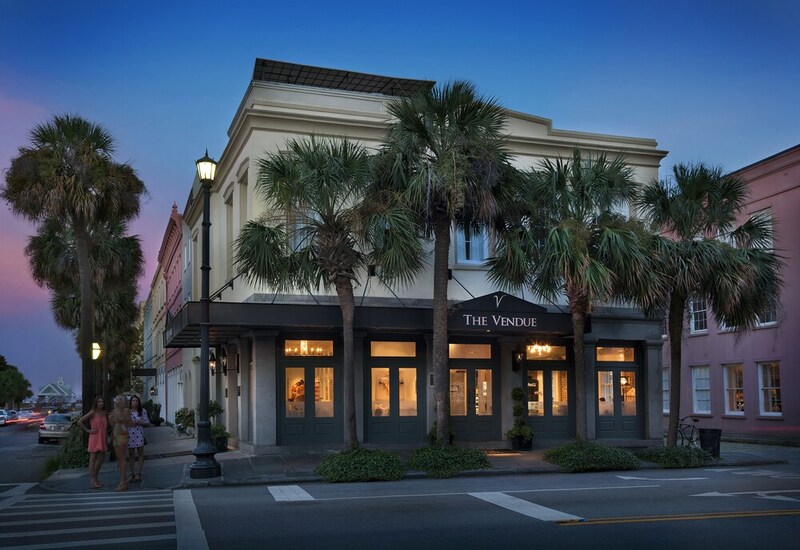 The Vendue was an excellent choice for our weekend in Charleston! The location is excellent, the service was top notch, and the hotel overall exceeded expectations. Not one disappointment! The free breakfast is also delicious! As well as the free milk and cookies in the evening! The hotel is in a great location and the staff could not be nicer and professional. The room was small but tasteful. The bathroom is tiny. We had the misfortune of having a room directly across from elevator and ice machine. If we had been staying longer we would have asked for a room change. The complimentary breakfast was a bit awkward as you had to place your plate on your lap as you sat on a chair in the lobby. However this is a temporary situation as the dining room is being renovated. I was slightly offended by all the requests for voting for their hotel in the Travel and Leisure Best of the Best award. According to the hotel they were rated #1 in Charleston in 2017. In my opinion, while this is a very nice hotel, I've had better experiences in other Charleston hotels. The Vendue is in an excellent location to enjoy the waterfront, restaurants and overall ambience of Charleston. A mostly-charming 200+ year old set of buildings comprise the hotel. The hotel's restaurant is on par with the other 4-5 star restaurants which make up the "foodie" core of Charleston. Our room was well furnished but noisy (adjacent to a loud stairwell) and had a less-than-charming slope to the floor. And the staff was absolutely wonderful, from our first contact with the Bell Captain to the last. From the champagne at check in, to the cookies and milk at night. I have never, ever experienced such hospitality. We were so impressed, we will never consider staying anywhere else in the future. We booked five nights at The Vendue, and are so glad we did! The location is prime for exploring downtown Charleston. The staff are extremely hospitable - greeting us with champagne and offering us a full tour of the property upon arrival; hosting nightly happy hours with gallery tours (they have an art gallery on-site! ); providing milk and cookies every night. The concierge provided great recommendations for restaurants in the area, and let us know we could use their sister property on Folly Beach if we wanted to go to the beach! That was great, because the property (Tides) has a pool, towel service, bar, etc. I definitely recommend taking advantage of that benefit. Our room was an interior King on the first floor. VERY spacious!! However, a bit loud. We could hear the people above us. So I'd recommend requesting a second floor room. Everyone was so nice and helpful. Beautiful decor with changing artwork. Good restaurants and near everything. Very comfortable, clean and quiet. Lovely hotel in a fantastic location for exploring historic charleston. We didn't stay long enough to take full advantage of amenities, but they were excellent. The staff was exceptionally polite and welcoming. The room was small but cozy and comfortable. Very clean. The only complaint I have was the bathroom had an old water/musty smell, especially if you left the door closed for hours while out. However, this seemed to be present thought out the whole historic district so it is likely due to the very old pipes and not necessarily the hotels fault. Located in Charleston Historic District, The Vendue is next to popular attractions like Waterfront Park and Charleston Waterfront Park. This 84-room, 4-star hotel has 2 restaurants along with conveniences like free in-room WiFi and a rooftop terrace. Free continental breakfast is included with your stay. This hotel is home to 2 onsite restaurants, perfect for a quick bite to eat. Order from room service to satisfy your hunger without leaving your room, or meet other guests at the free daily manager's reception. Guests can expect to find free WiFi and 32-inch a flat-screen TV with cable channels. Pillowtop beds sport Egyptian cotton sheets and down comforters, and the bathroom offers a hair dryer and designer toiletries. Other standard amenities include an iPod dock, free weekday newspapers, and free local calls. Guests of The Vendue enjoy a rooftop terrace, free WiFi in public areas, and a meeting room. Valet parking is available for USD 22 per night. Multilingual staff at the front desk are standing by 24/7 to help with luggage storage, securing valuables, and tours or tickets. Other amenities at this boutique hotel include coffee/tea in a common area, free use of bicycles, and a computer station. Thank you so much for your review, we hope to see you again in the future. Thank you for providing us feedback, we look forward to serving you again on your next stay. art boutique hotel in downtown charleston! Free continental breakfast is offered. Guests can enjoy a free manager's reception daily. The Rooftop Bar - Rooftop bar specializing in American cuisine. Open daily for lunch and dinner. The Drawing Room - Restaurant and bar specializing in American cuisine and serving breakfast and dinner. Recreation features at The Vendue include complimentary bicycles. The preferred airport is Charleston, SC (CHS-Charleston Intl. ): 23-min drive, 13.2 mi/21.2 km.